Good look at the work of ICT group at the Bank, including our project in Tandale. And a nice post from our support partner, Twaweza. And a blog post by Josh Goldstein. The first community forum went well. It was deal breaker for the project in the sense that if we didn’t get the community to share our ideals and objectives, making them their own, then the project would fail. Now the map is basically complete for first draft. We have enough of a basemap so we can now support platforms like Ushahidi and enable blogs to be geolocated. Collecting the data and producing the map, as I’ve previously mentioned is only a first step. The same can be said for involving the students and community members. By creating a small nucleus of highly engaged people, proficient in mapping and storytelling techniques understand the project, they can evangelise the project to others in their community. This ‘infects’ the community from the inside allowing for more people to interact and share the project without ‘outside’ involvement. This will in time hopefully reach a plateau where the entire process of updating the map, reporting and blogging becomes self-sustaining using only the initial equipment and investment. With this in mind, in the build up to the final community forum of the project (where presentations will be made to the community as a whole ie. interested citizens, civil servants and politicians) we gave a ‘pre-release’ talk to ten community based organisations. The format for this was quite simple, the students introduced the map with it’s features and intended functionality and the community members introduced the storytelling elements. Within this process I spent most of it being a photographer and an observer. It wasn’t quite seeing the monster you created evolve but when presenting both students and the community are owning the process. The community organisations engaged in a Q&A session then participated in reporting using Ushahidi. During the Q&A many questions dropped out regarding the future of the project and how the map can be used further. Because we are still formulating the future strategy it is difficult to say what the next step will be, but it will be along the lines of franchising to other areas overseen by community, NGO/CBO and Ground Truth, constructing this framework will be taking place for much of the coming week. We are also printing the map and distributing it. This is key; in using Open Street Map, the collected data is freely available for viewing and data analysis without restrictions like a prohibitive licence. However accessibility to computers and internet understandably is a problem in communities like Tandale. To enable the community to view their map we will be printing A2 maps for placement in the sub-ward offices and printing A4 sub-ward handouts. By placing it in a communal areas for each of the communities, we aim to reduce the barrier of people using the map by making it accessible. This process has started with our small nucleus of students and community, expanded by involving community based organisations and will be expanded further by integrating the map into governmental offices at the sub-ward level. Having the map built into the fabric of the community from the beginning of the project should make further incremental additions easier. Community organisations being fully involved in the project is the next step, the process has been started and the ball is rolling. However Eid is coming in the next week, so everything is going pole pole, Swahili for slowly slowly. However tangible results are starting to become very clear, on all levels with all stakeholders. Originally posted by Mark Illiffe on his blog on August 29, 2011. Mark is working with GroundTruth in Tandale, Dar es Salaam this month introducing community mapping and reporting to Dar es Salaam residents, in a project supported by the World Bank and Twaweza. Within the project we have effectively split into two groups along the lines of students and community members. The students are effectively bug hunting, filling in missed tracks and POIs. 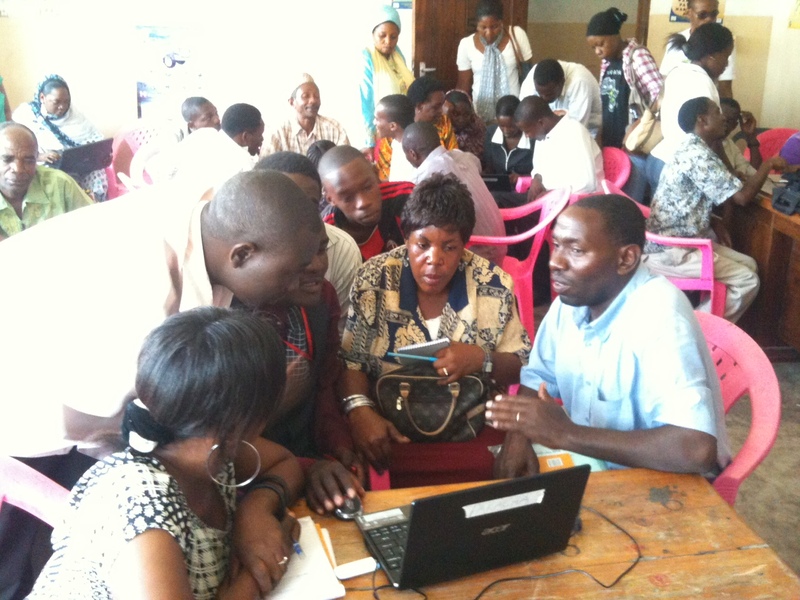 The community members are focusing on the submission of data into the Ushahidi instance, http://tandale.ramanitanzania.org/ushahidi. Today was quite special in that the Sokoni sub-ward officer joined one of our community teams, reporting the problems within the community. They engaged fully in the process, finally seeing the problems they had found on the map. I could feel the sense of achievement from the community members and students. The community members were animated at showing their work to the representatives of the local government, especially those who were on friendly terms with the officials. Initially I feared that the dynamic of student and community would be one that would be difficult. The students are from Ardhi University and are the best and brightest urban planners that East Africa has the offer (the students come from Zambia, Kenya, Rwanda and Congo). They are on average technology literate and have, with some guidance, become power-users of JOSM and other OSM tools. 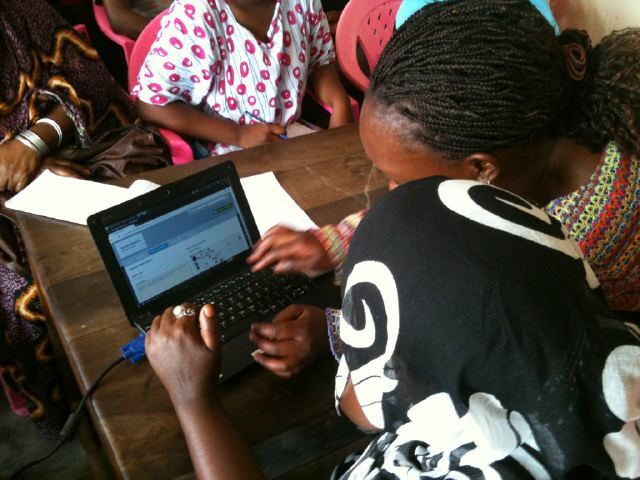 Understandably the community took time getting to grips with the software and methodology. We ran a Saturday session, now they are quite proficient with computers, GPS’ and cameras. Closing the gulf the community can help the students and vice-versa. Because we wish for the project to be sustainable the drive must come from the community members, and it has. They’ve really taken ownership of the project. Before they would be querying the OSM Tags, or how to pull tracks and waypoints off a GPS. Now they navigate all tasks with ease. We start each mapping session at 0900 sharp. To be ready for this time, we arrive at 0830 to set the projector, plug laptops etc. Now I set the projector up, once I’ve handed out the laptops. Nearly all members (community and student) are present, ready and waiting. They, and by extension, Tandale, now own the project. Originally posted by Mark Illiffe on his blog on August 27, 2011. Mark is working with GroundTruth in Tandale, Dar es Salaam this month introducing community mapping and reporting to Dar es Salaam residents, in a project supported by the World Bank and Twaweza. Two weeks or so ago I posted about the impending Map Tandale project. In it I spoke about the broad aims of the project and the methodology. It was accompanied by an almost blank slate; the map below. This is compared with the map above taken on the 19th of August 2011. Quite a lot of progress here! One thing that should be considered is the schedule upto this point. We held the community forum on Tuesday 9th of August. Wednesday was about the community and students working together and getting familiarity with the GPS;mapping with your feet. Thursday and Friday downloading GPS tracks and editing with JOSM was covered. Because of enthusiastic community members and students we ran an additional session on Saturday, attended by a few, to further explore the editing process. This meant on Monday we could really get started with mapping with everyone at the same skill level, and we did. I now think we’ve got around 90-95% of the major tracks done, the rest of the tracks should be finished on Monday/Tuesday. POIs like water tanks and toilets are in, again we have some areas that need to be mapped and these will be picked up by Tuesday. Because of us nearing completion we’ve entered phase two of the project; using the map we’ve created to tell stories and highlight issues. To do this we’re usingUshahidi, categorising reports and issues along Water, Health, Education, Accessibility and Security. These themes were identified, not through previous experience, but from community members themselves. In the community forum they provided areas where they believe improvement is needed. With us delivering on a system that monitors what they want monitoring we hope to give the community ownership of the project. Once the taxonomy exists within Ushahidi we requested that the community enter some of the issues that they face along the identified themes. After familiarity with the system was gained they then went out into their sub-wards, their communities, and gathered stories and issues that were happening then. The website for the Ushahidi instance is http://tandale.ramanitanzania.org/ushahidi/, please do have a look at it, though you will probably have to translate the reports! One point of note is the name of the project; also chosen by the community. Ramani is Swahili for map. 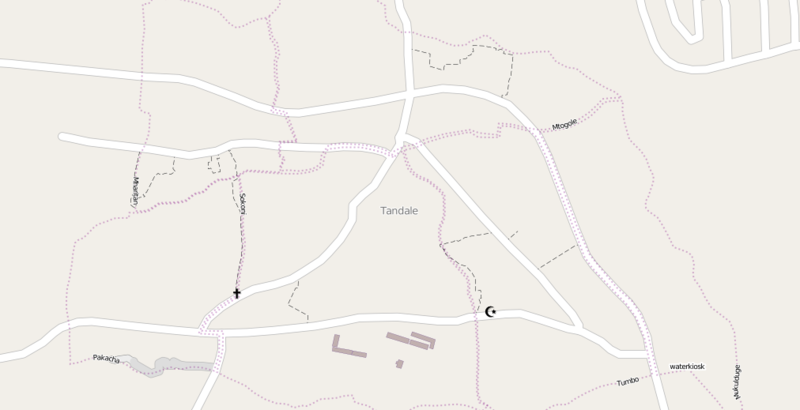 Ramani Tanzania, Map Tanzania. I believe that the community really feel part of something and are anxious to contribute further. Understandably this is only the first step, realistically we are barely two weeks into the project, however it is shaping up well. In the coming weeks we will focus on using the map to tell the stories and issues in Tandale and looking how the project can become sustainable with a tangible benefit. So far the tangible benefits encompasses the urban planning students who have gained surveying knowledge and the community members who have improved their own skills with technology, however we want the project to succeed and be a continuing success. To do this involvement needs to occur between Community Based Organisations, Non-Governmental Organisations, Charities and the City Council. We have already engaged these actors on varying levels but will ramp up interaction in the coming weeks. As a parting note I would like to personally thank Lucy Fondo and Hassan Abdalla from Map Kibera. They engaged the community members and students with equal aplomb and along with Simon Kokoyo, from Map Mathare, smoothed the implementation of the project removing obstacles like language, making it child’s play. 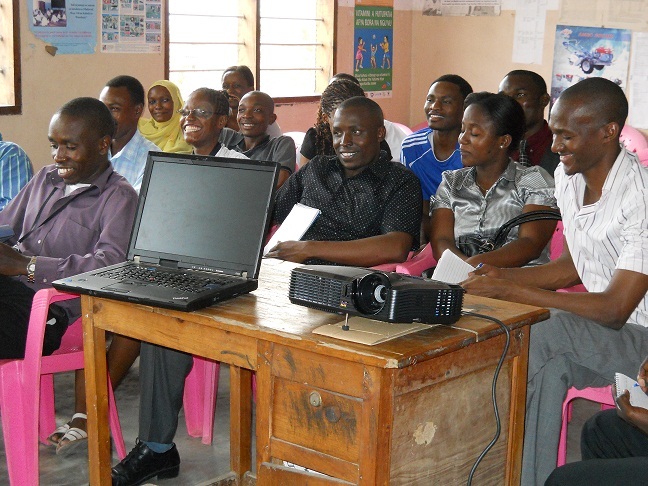 In June, GroundTruth began planning a project in Dar es Salaam, supported by the World Bank and Twaweza. We’re training in both mapping and citizen reporting in Tandale, an informal settlement of Dar. During August, we’ll be working with both community members and urban planning students at Ardhi University to create maps and build reporting resources for this community. Since Tanzania is so close to Kenya, we wanted to involve Map Kibera Trust members as much as possible in training their neighbors. Though they share a language, socially and politically Tanzania is about as far from Kenya as you can imagine for a country whose border with its neighbor was only drawn during the last century. The socialist roots in the country, as well as the nation-building efforts of Julius Nyerere have left their mark. Kibera is also a far cry from Tandale, as we found out in June – with a much lower population density, it suffers from problems of rapid urban growth and lack of planning, but appears much more like a rural village, with space at less of a premium and social problems that appeared to us to be much less acute. Computer and internet usage also aren’t nearly at the level they are in Nairobi. 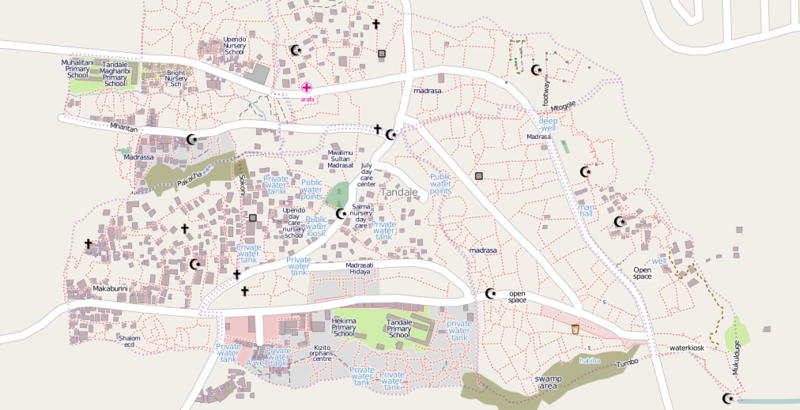 It will be interesting to see how the techniques we’ve used in Map Kibera translate here. Map Kibera Trust members Simon Kokoyo, Lucy Fondo and Hassan Abdalla, along with project leader Mark Iliffe, have been launching the activities this past week. We’ll repost some of their blogging to paint a picture of the activities. “The forum was started off by a speech by Tandale Word Executive Manager. More than 37 people including community members. Participants were happy to learn that they can be able to produce a map about their community and use to engage with the government and NGOs in the development and improvement of infrastructure. Currently Tandale and most of Dar es Salaam appears as blank spot on the Open Street Map platform. For the next four weeks, Map Kibera Trust will be in Dar es Salaam training community members and students on community participatory mapping skills, use of simple technologies and citizen reporting. Lucy and Hassan will be writing updates on most days about their experience. 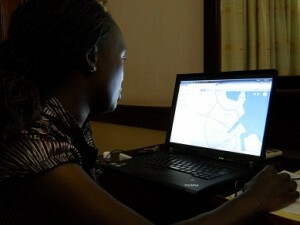 Their posts are on Map Kibera’s blog. Here is Lucy’s take on working with women in Tandale: “Today (9/8/2011) I was in the company of community members from Tandale, Dar es Salaam to help them undertake mapping of their own community and also talk about community media. To be in Tandale, Tanzania was exciting but being with follow women was even more exciting. When starting the discussion about the importance of mapping, it occurred to me the issues which women were relating directly consumed a lot of time. When I asked one of the women what she would liked to be mapped in her area, she said, toilets and water points. Reasons, she said in Swahili “wakati wa mvua, jamii yangu (Mukunduge,one of the 6 sub-wards) ni kawaida mafuriko na maji machafu kuwa kila mahali” (when it rains, my community (Mukunduge) is usually flooded with dirty water everywhere). She believes by having a map, she can be able to talk confidently and convincingly with the municipal council about flooding problem in her community. I have been in Dar es Salaam in Tandale and Sinza areas. One can witness the dominance of men in many cyber cafes. There is higher usage or percent in these cyber cafés. 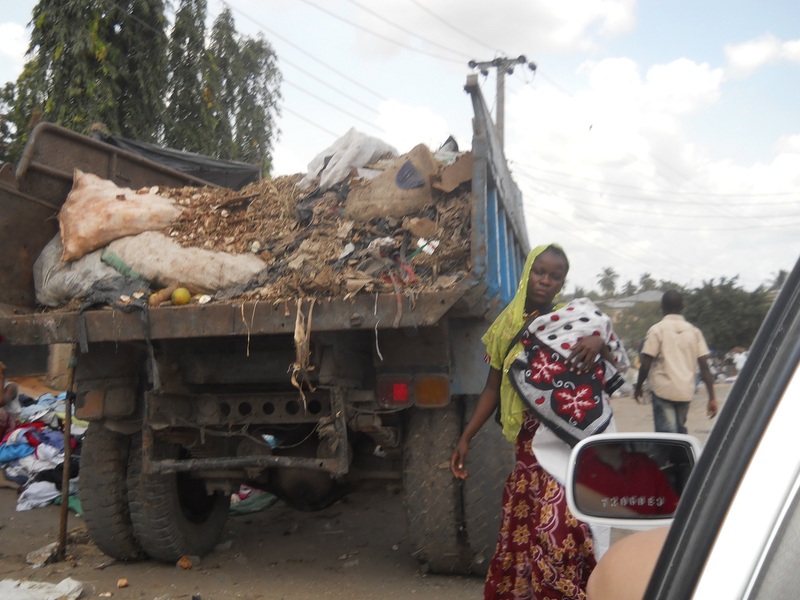 “Most of the farmers around Dar-salaam take their agricultural produce to Sokoni market(Tandaleward).The most amazing thing about this market is that you will always see a municipal council’s lorry packed somewhere around ready to collect garbage from the market.For me, this is welfare because when I compare Sokoni market with Toi market i.e. in Kibera, I see I a big contrast. In Toi market you will never see a lorry coming to collect gabbage.The burden of garbage collection is usually left to the business owners….